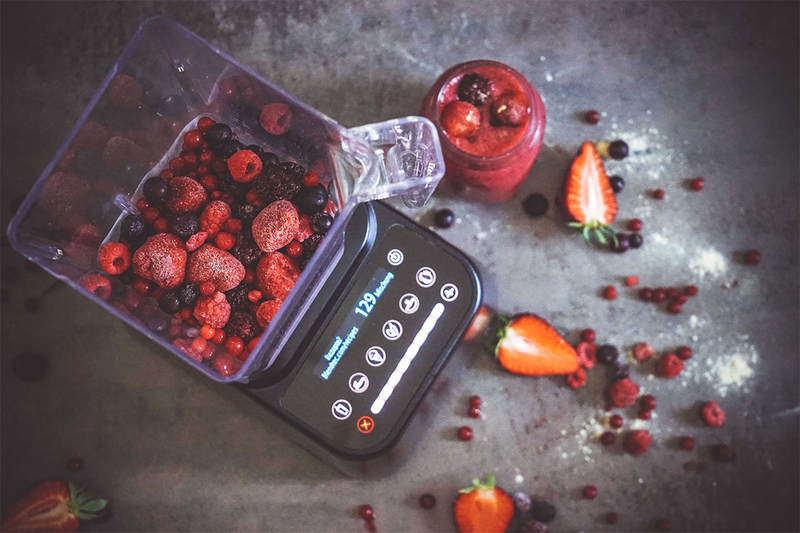 Blendtec Wildside Jar – Experences & Details with all tips and tricks! The Blendtec Wildside Jar Plus ist the Premium Jar and also the jar that comes with every Blendtec Designer model, and also the Blendtec Pro 800. The Wildside Jar Plus ist the biggest jar for domestic use and has an enormous capacity of 90 oz: That makes a lot of smoothie! Especially great for families, so one blend could „feed“ four. The Wildside Jar was tested for commercial use before it was also available for domestic use. If it lasts long for businesses, it was definitelz ready for the home! It's the jar that revolutionized high-speed blending. The WildSide features an extra-wide base (The Wild Side, the fifth side) and a narrow fifth "wild" side that helps create a faster, smoother blend, especially great when you use frozen ingredients. The WildSide jar also features two vertical ridges on the interior walls to disrupt the blending pattern even further and accelerate the blend. The result? The fastest, smoothest blends yet. The Jar is easy to clean and the blade is not sharp at all! All Jars are made of Tritan and are free of BPA! You can use your Wildside Jar for basically anything, for dry and wet ingredients. You have one jar for everything – no need for multiple jars! You can chop up herbs, blend the smoothest smoothies, you can cook soups in there etc. There is nothing the jar can not blend. But please do not fill fluids in there above 80 degrees celcius! Many retailers do not tell you the whole truth, they claim that the Wildside Jar is too big for a household of 1 person, that is why you also need the Fourside Jar. This is not the case and certainly not true at all! Why is it then that for commercial use, mostly the Wildside Jar gets used? And they only blend Smoothies per person, so not a lot, maximum of 300 or 400ml, basically one or two cups of smoothie. This is not a lot but weird that it works right? So don‘t fall for any false advice, you do not need more than one jar. If there is not so much in the jar, it even benefits your smoothie for there is more oxygen inside, which makes your smoothie super creamy! Nothing is worse than just a blob of smoothie that falls into your glass cup. With the Wildside Jar you will get the creamiest smoothie ever! An often asked question: How to properly clean the Wildside Jar. Add 1 cup (240ml) of hot water and a drop of liquid dish soap to the blender jar. Place the lid tightly on the jar. Place the jar on the blender base and press “Pulse” for 5 seconds. If your blender has a Clean cycle, press the “Clean” button. Rinse well and make sure to dry the jar as well. When you use a drop of liquid dish soap when cleaning your jar, it actually helps the blade and the inside of the jar to last longer,it acts like a protection layer, especially when you do not use your Jar so often. We recommend to clean your jar like this at least once a week to maintain a beautiful, clean jar for a long time.